How Do You Get to Calanggaman? * Ceres buses bound for Bogo leave every 30 minutes. * Ceres buses bound for Maya leave every 30 minutes. All nonAC. ** If you're in Malapascua Island, you can also rent a pumpboat to take you to Calanggaman. * Cokaliong schedule and rates here. Of course you can probably get a lower price for the pumpboats, depending on your haggling skills :-) Or you can also opt to look for a smaller boat if the group is small. But I would recommend a big sturdy one as the waters around Calanggaman are normally choppy. If you'd like to contact Palompon Tourism for questions about the island, fees, table rentals, etc, you may reach them thru the following numbers 0905 856 2086 / (053) 555 9010 / (053) 3382094. Where is Calanggaman Island, you wonder? Checked the map (or several maps) and couldn't find it? I googled for maps showing where the island is and after so many links, finally found one that has teeny tiny Calanggaman on it. Now that we've spotted the island, what's the shortest route? Looking at the map, I'd say via Nailon, in Bogo, if you're in Cebu, or via Polompon, if you're in Leyte. True enough. But, coming from Cebu, we didn't pick Bogo, instead opted to take a pumpboat from Maya (where you can also hop on an outrigger to Malapascua Island) at Daanbantayan (contact Seri Pañares at 0915 835 7011). Reason: the pumpboat we contacted in Maya was bigger (26 cap.) and had lifevests. Am I a worrywart? Prudent, more like. The waters between Cebu and Leyte can get real rough. The day we set off for Calanggaman, the sea was calm. Very calm. It was like sailing on oil. (According to the warden of the island, rough waters are more normal.) Another plus was spotting dolphins on the way, and sea turtles on the way back! 1. Clear turquoise waters, yes. 2. Sandbars on the east and west ends of the island. Do not attempt to swim here unless you want to get swept away in no time. 3. Cottages for day use are available for Php 250. 4. Cottages for sleeping? None. Bring a tent or sleep on the sand and pray it won't rain. 5. No freshwater for bathing, washing, drinking. Bring gallons of drinking water. 6. Drinks are sold by the LGU but there are times only the lifeguard is available (and so the store is closed). Better bring your own supply. 7. No restaurants, sari-sari stores, markets, etc. (It is a small island!) Bring your own food if you don't want to starve. 8. There is an area for grilling. Bring charcoal. 9. No trash bins. Please bring garbage bags and take your trash back with you to the mainland. 10. There are two toilets on the island. Flush it down with seawater from a barrel outside. 11. A changing room is available. 12. No electricity. Bring flashlights (and batteries!). 13. Nearby is a pawikan (Philippine sea turtle) sanctuary. 14. You will find many giant clams on the waters off the north side of the island. Don't forget your snorkel and mask. 15. 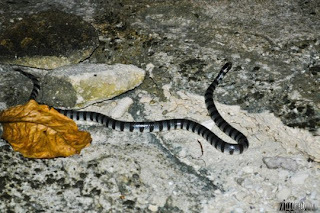 Seasnakes come out at night and rest on the rocky part of the island. Stay away! Okay, so I obviously don't do itineraries. My "itinerary" usually just shows travel time and the rest is up to me and my companions, whatever we feel like doing. If we're hungry, we eat. If we feel like playing games, then games we do. Feeling tired, then it is time to sleep.